Twenty Five Hours is a dynamic small chain of boutique hotels that is about to launch its latest hotel in Vienna. The company has already gained a lot of praise for its extant projects in the German cities of Hamburg and Frankfurt that place vibrant and playful design at the centre of a hotel that, as the name intends, is a hub of leisure and fun all around the clock. Needless to say if you have that much energy, one of the key target markets of the chain is the hip twenty-something city traveller. And, smartly putting its money where its mouth is, those in the industry have paid careful attention to the company’s policy of offering special discounts to visitors under the age of twenty-five, cleverly encouraging brand loyalty in the design-conscious youthful city tripper. As with the previous hotels, the new hotel in Vienna is not simply a matter of cutting ‘n pasting the design concept of the original hotel. For example, the special project for a Frankfurt hotel saw the company collaborating with Levis to realise a new design concept from top to bottom. Twenty Five Hours is conscious that each new hotel should be approached afresh as a design opportunity and the Vienna hotel is no exception. 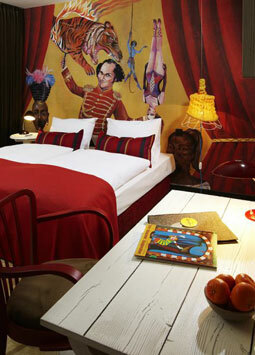 At the 25 Hours Hotel Vienna, which will open in April, the circus comes to town. Designed by Dreimeta, the creative studio founded by Armin Fischer based in Augsburg, the designers have used the location of the new hotel as the source of inspiration. The Prater, the Museumsquartier, Schönbrunn, the Vienna Opera, Life Ball or even the famous Spanish Riding School; no matter where one goes in Vienna one is on show, on stage or part of some grand spectacle. And, what Dreimeta has come up with in response to all of this is that Vienna is literally a circus. The spirit of sawdust, velvet curtains, spotlights and colourful carnival art motifs are carried through in each of the 34 suites, though no two are exactly identical. Some are styled along more traditional hotel lines whilst other guest accommodation is fitted with more apartment-like self-catering facilities and spacious private lounge areas. Up on the top floor, the penthouse suites see the circus theme twist in an even more luxurious direction, a suitable accompaniment to the glamourous private rooftop terraces with their spectacular view of the city on the Danube. Rather cleverly, the main public space of the hotel is also located at the top level meaning that guests not lucky enough to be accommodated in one of the dachboden loft suites can also benefit from the spectacular views. Meeting friends for a coffee or a glass of refreshing local wine or even as a relaxing place to work during the day, the main public space offers calming views of the local trendy neighbourhood that combines modern architecture and baroque, close to the cultural museum hub and trendy café life of Vienna. 25 Hours Hotel Vienna opens in April 2011 and is offering special launch deals on most of the accommodation including the aptly named Ringmaster Suite.